When it comes to hurricanes, preparation begins with determining where you are in the ‘cone of possibility’ (as opposed to the ‘cone of silence’), that rarely-accurate imaginary, studied, hypothesized passage of potential landfall. If there is a relative probability that the hurricane will strike, then it is a matter of stocking up on imperishable foods, filling cars, gas tanks and generators with gasoline, checking batteries and flashlights, charging chargeable devices, cutting down coconuts (aka projectiles), sealing important documents, putting dry clothes in protective containers, and installing storm shutters. 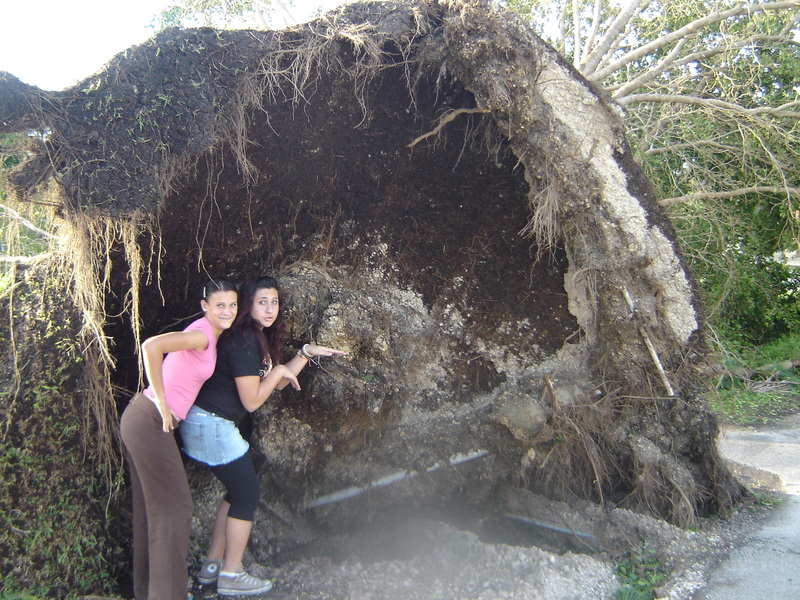 Then you just go through the storm (the picture in this post is from our church property in Miami after Hurricane Wilma in 2005 – yes, that is a single fallen tree!). When a storm closes in on a community, at that point all we can do is ride it out and wait. Last week our community, Ellicott City, experienced a horrendously tragic event where two college girls were instantly killed after a train derailed beside the very bridge they sat on – probably one they had sat on dozens of times when many trains had passed before. It is as though a horrible storm blew in for an evening and there was nothing we could do. The storm is still raging – there is great pain. Answers are insufficient, even insulting. There is no substitute for grief… or time. Our Comforter is God (John 14:16) and He alone heals. Unanticipated tragedies and events have a way of deceiving us into thinking that they are exceptions in an otherwise perfect world. But they aren’t. They represent this broken world’s true identity. I hate that so much. I hate that it is all so screwed up – but it is. I hate the suffering that family and friends endure, along with the rest of a world that was created to be so beautiful. And we are called to wait. Waiting goes against every instinct in my being. But deep within I know that I am far less prepared for the storms I face than I would like to admit. I don’t know how this waiting thing works (Isaiah 40:28-31), but we are promised something we can’t produce when we do. We are promised endurance and hope, none of which we feel during the storm – but somehow and mysteriously it comes. No answers. Just God. And then the storm passes. By then all power is out and a few hours seems like the entire night. The day after is a surreal experience both in marveling at the damage and debris, and in celebrating survival. It also marks the onset of entering into one’s community to share in the collective effort of healing in the neighborhood. I think this is who we are: Unfinished sons and daughters of God who find their mission in the healing work of the gospel in a storm-wrecked world. I will tell you that I don’t like the storms, and anyone that tells you they do is probably lying. They wreak havoc with my comforts, and sometimes bring to pass my deepest fears. But I’m glad that God doesn’t keep His children immune to them. Through us Jesus enters into the world’s debris, even as He did into our lives when He redeemed us. I have no other answers – and need none. We have Jesus. And this enables us to ride out the storm – because He did. Spoken like a Floridian at heart but living in the state of God’s grace. Blessings, Mike. Mike, This is way better than my original idea!! You are a gifted communicator, and even better at inspiring and encouraging. Thanks for reminding us to a). recognize this fallen world in which we live, honestly and to b). keep the faith in the only One who will sustain us and be present with us amid whatever storms we face. I love the reference to those great words in Isaiah 40. It has become a very powerful, and personal, new favorite for me these past 4-5 months. If I can inspire you to write this way again, in any small way, I’ll do my best, captain!! Still praying for all those mentioned dealing with current, and possibly, future storms. But hey, hasn’t He stilled the winds and the waves before? I like that, like Maxwell Smart, your cone of silence was not in working order when it came to the subject of waiting. Thank you for gifting us all with your upbeat ‘take’ on riding out our storms. Oh, and I do hope your friends and family were fine at points south. For Issac’s drive past Tampa, I am thankful I can quote Agent 86 and say, “Missed it by THAT much:)” Blessings to you and Katherine……. You are currently reading The Mystery of Waiting (aka Riding the Storm Out) at unfinished1.